Former employees from the Venezuelan bottling plant have ended their blockade after Coca-Cola sought a legal ban on the blockade. Production at the Caracas-based Coca-Cola bottling plant had been brought to a standstill last week after former employees mounted a picket, demanding the company pay out £1,220,800 of overdue social security payments between 1,500 workers. Coca-Cola maintain that they will only settle with 65 former employees. Libcom.org reported on Thursday that the former employees had been camping overnight outside the bottling plant and administrative offices, while shortages of Coca-Cola had been reported throughout the country. 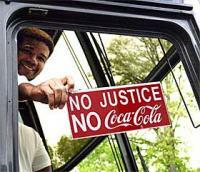 Coca-Cola sought a Supreme Court injunction to end the protests last week, and the demonstrators have since ended their pickets. The workers have also sought legal help and have now asked the Supreme Court to review cases demanding Coca-Cola pay out. The workers have the backing of Chavez's government and pro-Chavez legal professionals.